‘Tis a pity what’s happened to upscale, authentic Italian food in our humble burg of late. Valentino closed late last year. Circo is soon to, and Sirio is but a semblance of its former self. The glorified accountants (read: food and beverage execs) who run these joints in the big hotels are betting the hoi polloi won’t notice the dip in quality…and they’re probably right. Slap anything on a noodle, the thinking goes, and mid-America will beat a path to your door. Eating Las Vegas, however, cannot be fooled so easily. When the fromage is a little less fresh, the salumi cut a bit more sloppily, or the sauce a tad too suspicious, we notice. Or when a place is cravenly trying to exploit some suspect TV fame (à la Buddy V’s) or resting on laurels decades old (e.g. Rao’s), we notice that too. What we also notice is when there is passion and pride behind the food. When skilled chefs are giving it their all — carefully considering, cooking, and plating each dish as if they were presenting it to an honored friend. You don’t get that much in the Italian restaurants of Las Vegas these days, but you will get it at Allegro. Since taking over the restaurant formerly known as Stratta (and formerly known as Corsa Cucina before that) two years ago, Executive Chef Enzo Febbraro has made this place sing in ways it hasn’t sung since Steven Kalt left the premises in 2007. Febbraro is a Neapolitan by birth and a basso profundo by cooking temperament. Whether he is pounding a veal chop into pizza-sized impressiveness (pictured above), or rolling monkfish in house-made pancetta (and roasting it to perfection), you will know from the first bite you’re in the hands of a master. Deep flavors are the rule here, plus a palpable sense of how to intermingle proteins with produce and build upon the tastes of both with a judicious use of accents and herbs. Does anyone in town make a better Marsala? Or osso buco? Emphatically no. Neither can many Italians compete with his carpaccio or clams casino. Our staff goes crazy for his pizzas (truth be told, they’re the best pies of any full service restaurant in Vegas), and ELV (a noted beet hater) has even been seen polishing off a plate of Febbraro’s beet, bean and pear salad. If seafood’s your thing, don’t miss the “Calamarata” — a winy stew of monkfish and lobster — or the “Risotto Pescatora” — which will knock you over with its intensity. And we haven’t even mentioned the pastas yet …which are the best things on the menu. If you’re the sort that likes a rosemary-pepper bite with your scialatielli (and let’s face it who doesn’t? ), then the egg carbonara-tossed-pasta will make you think you’ve died and gone to heaven. Ditto the Baked Lasagna — a meaty, layered delight that somehow manages the feat of being hearty, rib-sticking and delicate all at the same time. 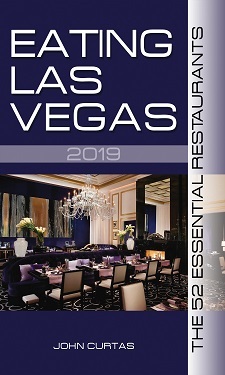 The desserts and breads are top-notch, as is almost everything that comes out of the Wynn/Encore’s bakeshop, and the wine list is well-matched to the food…and not quite as bend-me-over-and-hand-the-Vaseline-oriented as some carte des vins at some of the tonier Wynncore joints. Recommended dishes: All pastas; Pizza Margherita; Beet and Frisee Salad; Clams Casino, Carpaccio; Mozzarella Platter; Prosciutto Platter; Veal Marsala; Lamb Osso Buco; Veal Chop Parmigiana; Risotto Pescatore; Basically everything on the friggin’ menu. Don’t miss Scottish salmon paired with a large raviolone stuffed with finely minced artichoke, or zuppa di pesce, a huge crock of scallops, shrimp, cod, squid, clams and mussels in a tomato garlic nage. As befits the name, service at Allegro (Italian for “cheerful, lively”) is swift, and the wine list is loaded with nice boutique Italian choices, such as Livio Felluga pinot grigio and limited-production American gems (try the 2008 Daou Celestus from Paso Robles, Calif.). Don’t miss Scottish salmon paired with a large raviolone stuffed with finely minced artichoke, or zuppa di pesce, a huge crock of scallops, shrimp, cod, squid, clams and mussels in a tomato garlic nage. As befits the name, service at Allegro (Italian for “cheerful, lively”) is swift, and the wine list is loaded with nice boutique Italian choices, such as Livio Felluga pinot grigio and limited-production American gems (try the 2008 Daou Celestus from Paso Robles, Calif.). – See more at: http://vegasseven.com/2012/08/23/notte-worthy-italian/#sthash.CVjacfaz.dpuf Don’t miss Scottish salmon paired with a large raviolone stuffed with finely minced artichoke, or zuppa di pesce, a huge crock of scallops, shrimp, cod, squid, clams and mussels in a tomato garlic nage. As befits the name, service at Allegro (Italian for “cheerful, lively”) is swift, and the wine list is loaded with nice boutique Italian choices, such as Livio Felluga pinot grigio and limited-production American gems (try the 2008 Daou Celestus from Paso Robles, Calif.).Don’t miss Scottish salmon paired with a large raviolone stuffed with finely minced artichoke, or zuppa di pesce, a huge crock of scallops, shrimp, cod, squid, clams and mussels in a tomato garlic nage. As befits the name, service at Allegro (Italian for “cheerful, lively”) is swift, and the wine list is loaded with nice boutique Italian choices, such as Livio Felluga pinot grigio and limited-production American gems (try the 2008 Daou Celestus from Paso Robles, Calif.). Sounds ridiculously good. As good as Valentino’s? I may have to rent a new stomach my next trip to Vegas.